Artisan is a brand new range of tiebacks brought to you exclusively from Jones. It has a simple and classic design along with traditional shapes and rustic textures to make it perfect for any home. 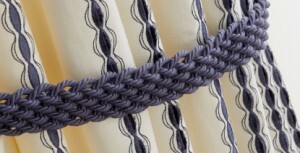 The Artisan tiebacks best feature is its rope like texture, which offers a simplistic and organic element, along with its dynamic design it can be extremely flexible to fit with any window display. This collection is available in 9 different colours ranging from neutrals to bolds; it can bring a hint of colour to a basic design, or add some texture to a flat surface. This collection goes perfectly with our Shalimar fabric; the colour schemes go hand in hand across both of the ranges, they are a great combination to mix or match. The simplicity of the tiebacks compliment the patterns of the fabric, making sure not to overshadow them, making them the perfect pairing of both traditional and contemporary designs.